The car is spun round the front of Kaczorowski’s HGV and then is smashed between it and the verge. Zbigniew Kaczorowski, 55, from Poland pleaded guilty at Milton Keynes Magistrates’ Court to careless driving on March 11. Posting the video on social media, a spokesman for Thames Valley Police police said: “This dashcam footage will shock you. 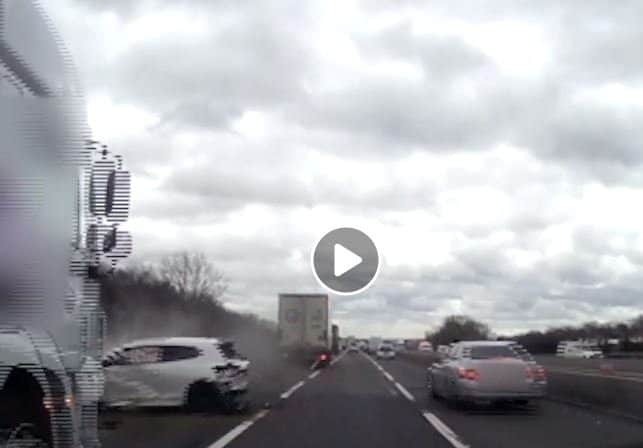 “On 07/03, Zbigniew Kaczorowski, 55, from Poland pleaded guilty at Milton Keynes Magistrates’ Court to careless driving after he crashed into a VW Sirocco on the M1. “Thankfully, the driver and passenger of the VW didn’t suffer life-threatening injuries.